Childhood friendships provide kids with much more than just people to play with. Learning to make friends as well as learning to be a good friend are important parts of a child's social development skills that will help them to find success in both their personal and professional lives. For their first few years, most children are exposed largely to family members and close family friends. Being on the receiving end of the unconditional love and acceptance that family provides gives children a solid base of confidence and self-esteem from which they are able to build further social attachments. Often, a child's very first friends are the children that they meet at preschool. Most of the learning that young children do is through play, and building social competence is no different. Typically, 2-3 year olds will initially play side-by-side, rather than directly with one another, but as they observe each other and become comfortable, the little ones will begin to interact and share toys. By preschool, kids become even more interactive, engaging each other in simple conversation. They will talk about the things that they did after school or on the weekend and respond positively to the stories of their friends. This give-and-take is a great step in social development as they work from being self-focused to other-focused. As friendships develop, kids become increasingly aware of the feelings of other people, expressing happiness when their friends are happy and showing empathy for a friend's hurt feelings. They will also seek out their similarities, instinctively knowing that sharing common bonds is important to maintaining friendships. They'll focus on favourite colours, foods, or games, and delight in the fact that they are alike in many ways. Another common development as friendship capacity develops is a child's desire to protect their friends. Friends stick together, and that lesson comes to most children during their school years as one friend goes through a difficulty and another's instinct is to stand up for their troubled friend. Further bonded by their common experience, their loyalty to the friendship deepens. Primary caregivers are responsible for seeing that the needs of young babies are met lovingly and consistently to help establish a feeling in the baby that the world is a safe and welcoming place. Parents and caregivers should encourage and celebrate the emerging independence displayed during this phase in order to build a child's self-confidence. 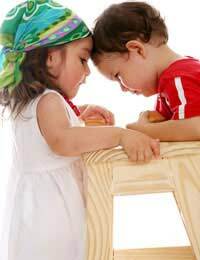 As kids become more assertive, reach out to others for friendship, and begin to explore their individuality, it is important that they be supported in their efforts, lest they feel inept and begin to mistrust their own abilities. School experiences come to the forefront, with children taking pride in planning and executing projects. The encouragement of parents and caring educators helps to build a child's sense of self-esteem, furthering their confidence and ability to interact positively in the world. At the threshold of adulthood, teens are faced with a number of important decisions about their futures. If they have built a solid base, they will have an easier time determining just what their place in the world should be. Preschool friendships are typically the first "give and take" relationships that kids have outside of their homes. Children aged 3-5 often have imaginary friends, which is perfectly normal and need not be a source of concern for parents. Early friendships are based more on circumstance (i.e. classmates, neighbours, attendees of the same play group, etc) than on genuine similarities. Kids tend to have a "best friend" throughout their school years, but in the early years, that best friend is likely to change several times. Most childhood friendships are between children of the same gender, with whom most kids feel that they have the most in common. Friendships are usually of high importance to children, especially in late childhood and adolescence, helping kids to strengthen their social abilities. I am now studying about social development and i think this is good. Social development is important, but it’s the parents who facilitate socialisation. They arrange interactions, whether it’s with family, friends, or things like nursery and pre-school groups. All of these things are vitally important to the development, as it exposes to child to adults and to peers in different groups and settings. This is a rather fascinating piece of infomation. Congrats. I think this information is good if you want to know about children from 4-11 in general but I think it need's to be split into different Social Developments for different aged children.